The Upland Footpath team returned to the fells at the start of April to commence this year's projects. This coincided nicely with a stretch of good weather. Our first project of 2015 has been on the path up Tongue Gill to Grisedale Tarn, near to the village of Grasmere. This path is on the Coast to Coast route devised by Alfred Wainright. This long distance route, of around 190 miles, goes between St Bees in Cumbria on the Irish Sea to Robin Hood's Bay on the Yorkshire Coast. The Coast to Coast route is one of the most popular long distance routes in the UK. It is also well known worldwide and the number of international visitors we have met seems to reflect this. The team were able to start this project immediately as rock we were using had been flown into position during last year's helicopter lifts. This rock was donated to "Fix the Fells" by a private land owner who last year completed a hydro-electric scheme on Tongue Gill. This surplus rock was a by-product of the excavations during construction. We always try to use rock that is local to an area for our work so this donation was gratefully received. As a popular route lots of work has been carried out on the Tongue Gill path over the years to tackle the problem of erosion. Path work is then monitored as new erosion can develop and previous work sometimes needs "fettling". This year's project involves a typical range of remedial work including drainage, stone "pitching" (both repairs and new) and landscaping work to stabilise erosion and remove side routes. A memorable part of this project for the author of this blog led to the title "A Reluctant Rock". Whilst working on a new section of stone pitching a suitable rock was identified. This rock was on the large side but was manageable and had several good faces making it an ideal step for walkers to plant their feet on as they follow the path. Towards the end of the first day, as time was running out, a slightly rushed decision to move the rock into position was made. Unfortunately the rock dropped into the hole at an awkward angle and refused to be manoeuvred into the desired position. The hole around the rock then had to be filled to leave it safe until the next time. On the return it proved very difficult to get the desired leverage on this rock with a metal bar and bedrock kept getting in the way. Lots of digging, levering and chipping away at the bedrock followed but still the rock remained largely uncooperative. Determination and patience were needed plus a reluctance to be "beaten" by a rock and it was eventually coaxed into position by lunchtime (albeit a slightly later lunch than normal). The saga of this rock did provide a talking point and possibly some amusement to passing walkers. Comments to a colleague working further down the path mentioned the size of the rock and one couple commented on their return journey that "He's still working with the same rock....". This reluctant rock was used for part of a longer section of work. Some side route erosion was developing next to some bedrock between two sections of stone pitching. This is because some walkers have a tendency to avoid bedrock. At the time of writing this blog our time on Tongue Gill is nearly finished. This is ahead of schedule largely due to the volunteer help we have had. We have several other projects this season including a return to Striding and Swirral Edges to continue work we have been doing there. We also have a project near the summit of Coniston Old Man where significant erosion problems have been developing. Last summer, I wrote a blog about the tender storage areas that we constructed along the West Shore of Windermere [Improving the lakeshore]. We built these areas to store all the tender boats in a few places along the lakeshore. Not only did this tidy up the lakeshore visually, but it also has the added benefit of reducing erosion to the lakeshore – including damage to tree roots and bark from having boats chained to them as well as the damage to the very fragile reedbeds from people launching their boats through them. But of course, tender boats are not the only cause of erosion to the lake shore/reedbeds on Windermere lake. These sensitive environments are also damaged by the waves created by swash from boats and strong winds. The reedbeds are also sensitive to shading from encroaching woodland and vegetation. Over-grazing and nutrient enrichment also plays a part in the decline of reedbeds (Canada Geese, ducks and farm animals). What are reedbeds I hear you ask? Reedbeds are a succession of young reeds (common reeds; phragmites australis) which colonise open water. As the reedbed ages, the successive layers of vegetation build up the water level gradually turning it into increasingly drier ground, allowing scrub and woodland to develop. In themselves, reedbeds are excellent habitats for coots, moorhens and other breeding birds. 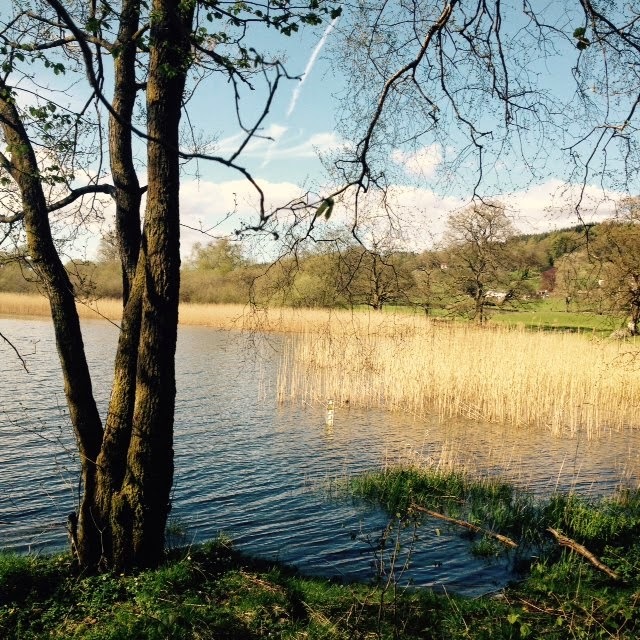 Research carried out by the South Cumbria Rivers Trust (SCRT) has shown that since the 1870s, Windermere has lost 90% of its reedbed habitat. Through a series of historical and more recent GPS mapping they have been able to map the loss across the whole of the lake [Reedbed loss since the 1870s]. Well now we have some great news for the West Shore. Our role as National Trust Rangers is to look after our special places, and this is one of those very special projects where we see something change from start to finish. We are working with the South Cumbria Rivers Trust to restore the reedbeds on the west shore as part of a wider project across the whole of Windermere. SCRT have been very lucky to get funding from the Waste Recycling Environmental Network (WREN) to potentially transplant young reedbeds from an RSPB site at Leighton Moss to try to rehabilitate historical areas of reedbeds, removing encroaching vegetation and cutting back trees that are shading these sensitive habitats. Newly planted areas will require the installation of fences and wave barriers to protect them as they get established. Quite what this will involve is still to be decided but I can see waders, lots of water and some great fun to be had with other rangers and volunteers! Watch this space. If you want to go and look at some fantastic examples of reedbeds, head to Esthwaite North Fen National Nature Reserve. Just at the north of the Lake, this Site of Special Scientific Interest (SSSI) is an excellent site to see successional reedbeds. It is so good that the Freshwater Biological Association (based down at Ferry House) have been studying the succession of the plant community from open water, fen and grassland for the last 45 years. Key species along the lake bed/shore include stonewort, Canadian pondweed, lobelia and shore weed, as well as yellow and white water-lilies along the lake edge. Common reeds (phragmites australis), common bulrush and reed canary grass are prolific in the reedbeds themselves. The reeds succeed to wonderful carr woodland with species such as birch, crack willow, and ash. The area supports breeding birds (including great crested grebe, teal, tufted duck, red breasted merganser, pochard and sedge warbler) as well as mammals, invertebrates and microscopic life. Go down on a sunny day and see what you can find! Look out for the work we’ll be doing over the summer on the west shore of Windermere!